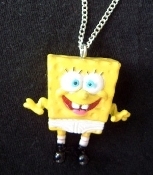 Funky Rare SPONGEBOB UNDERPANTS PENDANT NECKLACE - Big Funny Sponge Bob wearing TIDY WHITEY / TIGHTY WHITIES Under Pants Mini Figure Cartoon Comics Character Miniature Novelty Costume Jewelry - Approx. 1-5/8-inch (4.06cm) diameter rubbery pvc plastic toy charm on 18-inch (45cm) metal neck CHAIN with safety clasp. Choose neck chain or cord! *Please Note: We will send neck chain as described, if no options are chosen. Would you prefer 24-inch or 30-inch Neck Cord?